As I approach 300 articles for Rosacea News, it is time for a bit of a change. I started writing items in July 2005, and back then I wasn’t really sure what I’d find. Since then I’ve learnt heaps as I trolled the internet looking for fresh and interesting developments in the world of rosacea. Surprisingly, there is a lot of good information out there about ongoing research, resources and lots more. So Rosacea News is now running on a new web address with extra features that should make it easier to find what you are interested in. Also you can now add your comment on each post, so if you see something interesting or have something to add to the topic please use the `Leave a Comment’ part of the page. 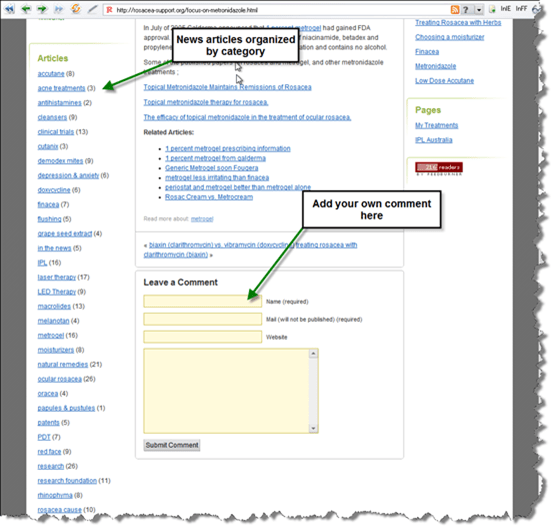 Here are a couple of notes about the new layout of Rosacea News. Click the image for a bigger view. What do you think of the new layout ? Do you find Rosacea News useful ? please leave a comment below. i don’t like the new design at all (besides it’s ability to provide feedback^^) – it just doesn’t look like a blog anymore. It is true that the front page is no longer a running list of items like the Rosacea News page was previously. 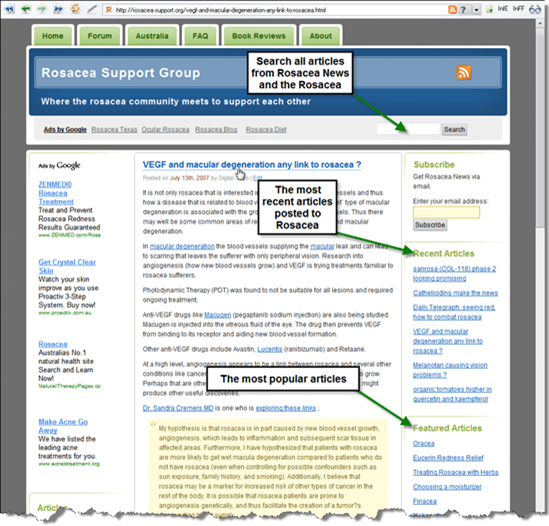 I have tried to combine the old Rosacea Support Group pages as well as Rosacea News into the same site with the same look and feel. Perhaps there is some other way I can also provide a running page of the last several news items – as well as the static welcome page. This is a great service for rosaceans. I have had this condition for approximately six years and I have always turned to your website for information. Thanks for all you do and let’s home better treatments are coming soon!! As a Rosacea sufferer for 30 years, and a broadcaster, I applaud your work on this subject. It’s a baffling disease at the best of times, misunderstood, with different treatments. I learned more from your newsletter than my doctor told me. I love this new look and the way you’ve organized topics! I can quickly locate and access what I need. I have added a “News” link at the top of the page that will allow you to have a running page of 6 news item at a time, and all you to move backwards and forwards through all the news. Hope this helps this site feel more like a normal blog.